Although Naushad isn't among the music directors I actively look for, there are a few of his scores I rate highly. I've posted one of them before; here's another. 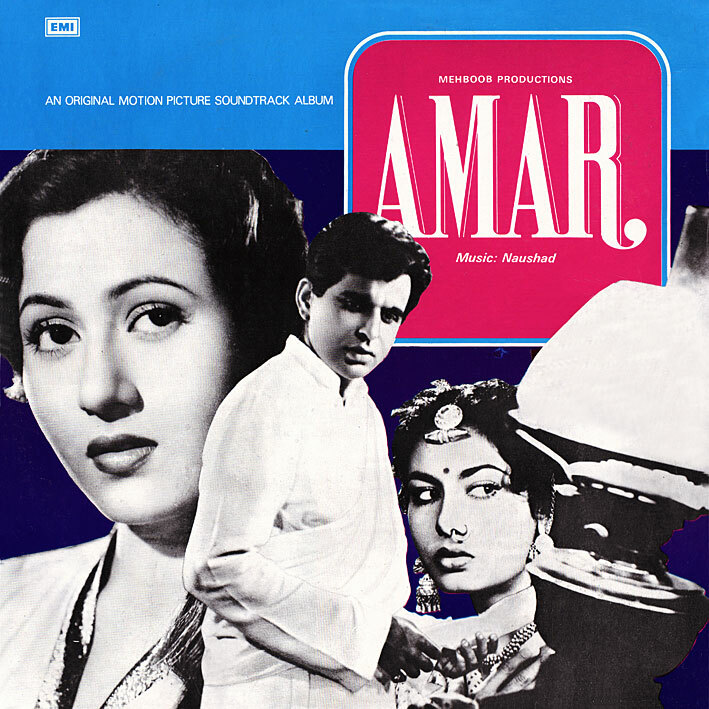 To my ears, 'Amar' [review] falls into the same general category as 'Detective' and 'Chhalia', full of enchanting melodies, exotic arrangements and old world charm. It's hard to pick highlights, but check out 'Oodi Oodi Chhai Ghata', 'Radha Ke Pyare Krishna Kanhai' and 'Na Shikwa Hai Koi' for starters; all wonderful. And the gorgeously evocative 'Dance Music' is one of my favourite Bollywood instrumentals. Is it just because I've played it so often that it sounds particularly familiar, or has it been sampled somewhere? This is one of Naushad's best. I love it! Indeed! And I just remembered you posted it ages ago. Beautiful stuff, thanks for posting it! Absolute gems... thanks PC as always. What's the next lot? Naushad has been a gr8 technician.. so the recording quality of most of his albums are of superior quality! Check out Mughal e Azam, Saathi, Leader.. fantastic stuff! Welcome on >jammagica.blogspot.com< favorite blogs list ! A humble request. Can somebody share these songs again ?